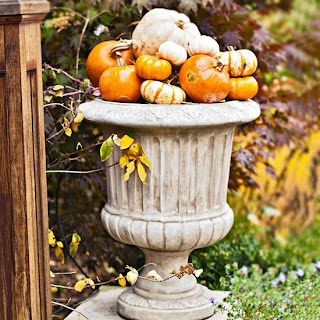 Planters ~ Pumpkins in various colors and sizes make a beautiful fall decoration when piled in a planter and placed on your porch. If your planter is too big for your pumpkins, use a block of florist's foam to keep your gourds at the top. 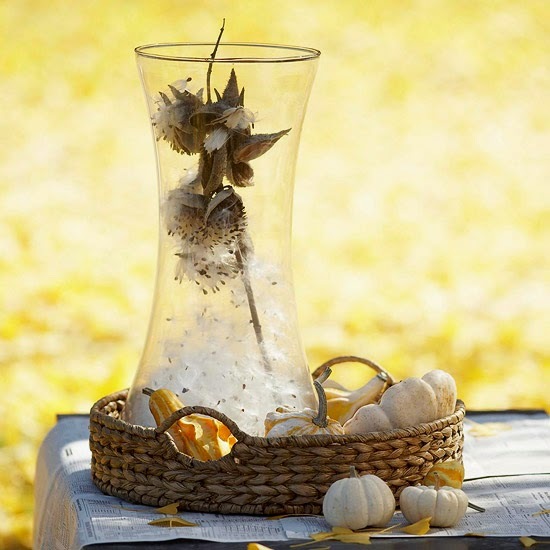 Centerpieces ~ Transform a traditional cornucopia into an outdoor table centerpiece that's absolutely wow-worthy. Shop the supermarket for squash, shallots, onions, nuts, and pears. Pile them in a woven basket that's treated to withstand autumn weather, along with a few dried naturals from a crafts store, and place the display on any outdoor surface. Centerpiece ~ Let nature set the table this fall with this rustic centerpiece. 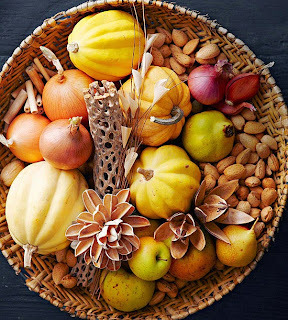 Fill a woven tray with small gourds, white and golden mini pumpkins, and a glass vase filled with downy milkweed seeds. Accent your outdoor centerpiece with calming shades of brown, gold, and orange. 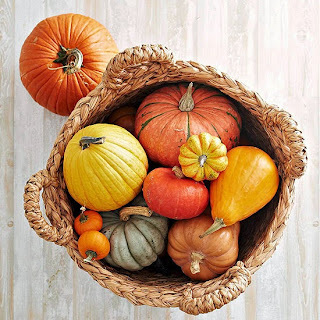 Basket ~ Fall gourds easily come together to make a simple outdoor decoration. Fill a wicker or woven basket with your favorite colorful fall pumpkins, squash, and other gourds, and place it on your doorstep, back porch, or patio. 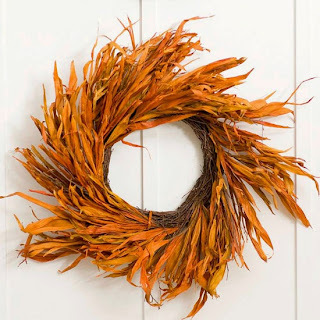 Wreath ~ Take the simple approach to fall outdoor decorating with our autumn-inspired wreath. All you need is orange-color raffia and an unadorned twig wreath for this easy, eye-catching creation. Bundle strands of raffia and pinch in the middle. Twist thin-gauge wire around the pinched center and attach to the wreath. Continue all the way around the wreath, being sure to fluff both sides of the raffia bundles so they flow in the same direction as the twigs.